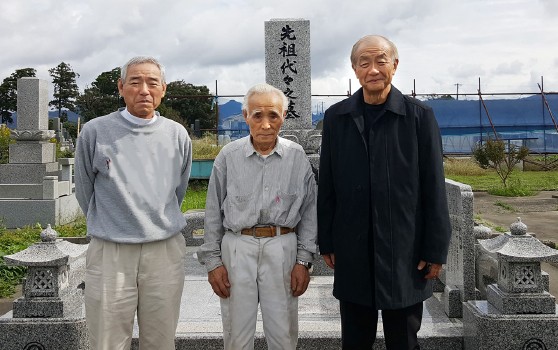 Ken Tagawa (right) with recently found cousins at the Sugai family gravesite in Niigata Prefecture in October 2017. A talk entitled “Okaeri (Going Home) – Retracing the Path of Our Grandparents and Connecting With Relatives in Japan” will be presented on Sunday, May 27, from 12 to 2 p.m. at Senshin Buddhist Temple, 1311 W. 37th St. in Los Angeles. One hundred years ago, our grandparents — or for some of us, our great-grandparents — were among the tens of thousands of Japanese who left Japan and took that uncertain voyage to the United States. They came from Hiroshima, from Wakayama, from Fukuoka, Okayama, and Kagoshima. Some came from Niigata while others came from Shikoku, and they set down roots in the U.S., and they started families. They found jobs and strengthened the farming and fishing industry, and they built numerous small businesses, temples and churches, and built thriving Japanese communities. Over the many years, the connection with our Japanese relatives at times waned. Ken Tagawa wanted to know more about his Japanese relatives and began tying together the scantest bits of information. Through his father, Ken had met his relatives from Hiroshima, but the linkages to his mother’s family were very faint. Ken wanted to know more about his Japanese relatives and began tying together the scantest bits of information. Nonetheless, through his research skills, knowledge of Tokyo and Japan as well as Japanese government ministries, and with the invaluable help of Yuuka Kojima, a colleague from Tokyo, Ken was able to find crucial data that suddenly brought information with amazing clarity about his maternal grandparents. Ken was able to find out where his relatives came from in Japan – even to the extent of pinpointing villages, neighborhood entities, names and possible addresses. One rainy morning in October 2017, thousands of miles from his home in New York City, Ken and Yuuka knocked on a door in a small town in Japan where a relative opened the door and that connection was re-established. Ken Tagawa, a Denver native Sansei who attended an inner-city high school, is a researcher/writer and consultant in human resources, training, employee relations and management who currently lives in New York. He holds a Ph.D. in Japanese politics and also studied Japanese history from the University of Colorado at Boulder. He lived in Tokyo, where he worked on his doctoral dissertation and was also a copy editor at a Japanese corporation in 1972-73. Ken has been a high school teacher (Asian studies, European history), and while working on his Ph.D at CU Boulder, Elaine Takahashi, as director of the Asian American Educational Opportunity Program (AAEOP) at CU Boulder, hired him to teach the first Asian American history/politics course at the Boulder campus in 1970. She then had Ken serve with her as a co-director, and later as the director of the CU Boulder Program, while she helped to establish the CU Denver AA EOP and directed a Denver/Boulder student and community API organization. Ken successfully directed the Boulder program and inspired AA EOP activist students to organize peaceful sit-ins at the Boulder campus program, which resulted in additional funding for hiring additional staff and for adding AA studies classes. His administrative work in higher education expanded to the human resources area, and he has served as a human resources leader at two universities. He also served as the chief learning officer at CUPA-HR, the national association for human resources in higher education. Yuuka Kojima, lives in Tokyo and currently works for an Australian company as an IT manager. She graduated from a Japanese university in Niigata-ken and also went to an American college in Illinois. She then worked for a Texas cattle corporation for eight years. She has a degree in zoology and a great interest in genealogy.